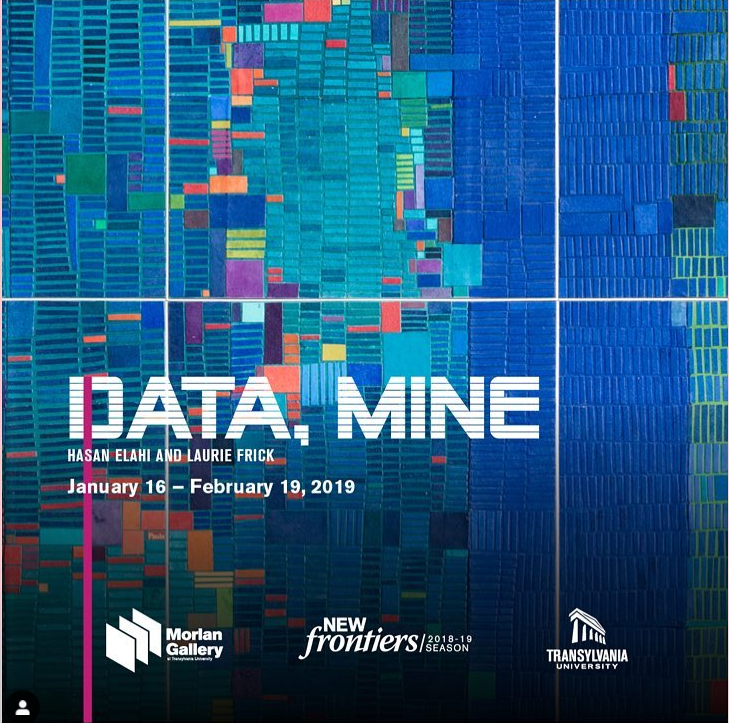 Thursday, January 24, 6 - 8 p.m.
An Artist Sees Data So Powerful It Can Help Us Pick Better Friends. NPR: All Things Considered. Feb 25, 2018. Ascher, Marcia. Mathematics Elsewhere: An Exploration of Ideas Across Cultures. Princeton, N.J: Princeton University Press, 2005. Badger, Emily and Quoctrung Bui. "Detailed New National Maps Show How Neighborhoods Shape Children for Life." New York Times. Oct 1 2018. Cervantes Saavedra, Miguel de, and Samuel Putnam. Don Quixote De La Mancha. 1998 Modern Library ed., Modern Library, 1998. Dutton, Denis. The Art Instinct: Beauty, Pleasure, & Human Evolution. New York: Bloomsbury Press, 2010. Elahi, Hasan. What Would You Do If The Feds Were Watching You? NPR: TED Radio Hour. January 31, 2014. Elahi, Hasan. "How to Invade Your Own Privacy So the Government Doesn’t Have To." Foreign Policy. May 2, 2016. Hasan Elahi’s 24/7 self-tracking website Tracking Transience. Freed, Ian. "Using Machine Learning to Analyze Taylor Swift's Lyrics." Codecademy. Sept. 19, 2018. Frick, Laurie. Laurie Frick ignite talk at Eyeo | nanobot murals + your data = immune boost. Sept.1 2016. Harari, Yuval N. Homo Deus: A Brief History of Tomorrow. NY : Harper Perennial, 2018. Lanier, Jaron. Who Owns the Future? London: Penguin, 2014. Lupi, Giorgia, Stefanie Posavec, and Maria Popova. Dear Data: A Friendship in 52 Weeks of Postcards. New York : Princeton Architectural Press, 2016. Mitgang, Herbert. Dangerous Dossiers. New York: Donald I. Fine Books/Dutton, 1996. Onians, John. Neuroarthistory: From Aristotle and Pliny to Baxandall and Zeki. London : Yale University Press, 2017. Saunders, Frances S. The Cultural Cold War: The Cia and the World of Arts and Letters. New York: New Press, 2013. Stinson, Elizabeth. "Paula Scher's Insanely Detailed US Maps Elevate Data Viz to Fine Art." Wired. Feb 22, 2016. Verdecchia, Guillermo. Citizen Suárez. Burnaby, B.C., Canada: Talonbooks, 1998. Wilson, Timothy D. Strangers to Ourselves: Discovering the Adaptive Unconscious. Cambridge, Mass: Belknap, 2004.